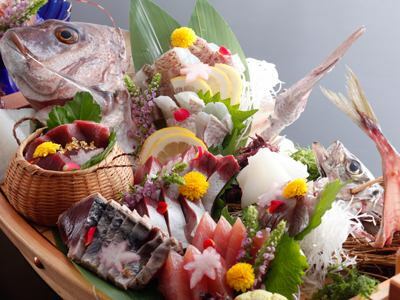 Noto Peninsula protruding in the Sea of ​​Japan is a treasure trove of fresh seafood.Wakura Onsen has a natural port of Good Nanao Port, and has prospered as a port town for collecting Noto marine products since ancient times. In the meals of heartfelt seasonal taste Peculiar to Noto to Peculiar to Noto, such as melting sweet shrimp, tightly tight bristles, squid and crabs are lined up.It is also a pleasure to start offering a local sake of Kaga · Noto, with a supple taste stolen by the wild waves. Kaiseki Meal, "Abalone Kaiseki Meal"
madder(Akane)Kaiseki Meal, "Crab meat menu"
"Shio Kaiseki Meal" is the basic Kaiseki Meal of our hotel where you can enjoy seasonal seafood of the Sea of Japan. A Kaiseki Meal dinner where you can enjoy Noto ingredients such as fresh fish landed from Noto fishing port and Noto Satoyama vegetables. We deliver seasonal seasonal ingredients such as octopus with seasonal seafood together with seasonal fresh fish sashimi, pot dishes and steamed rice with steamed rice in various dishes. 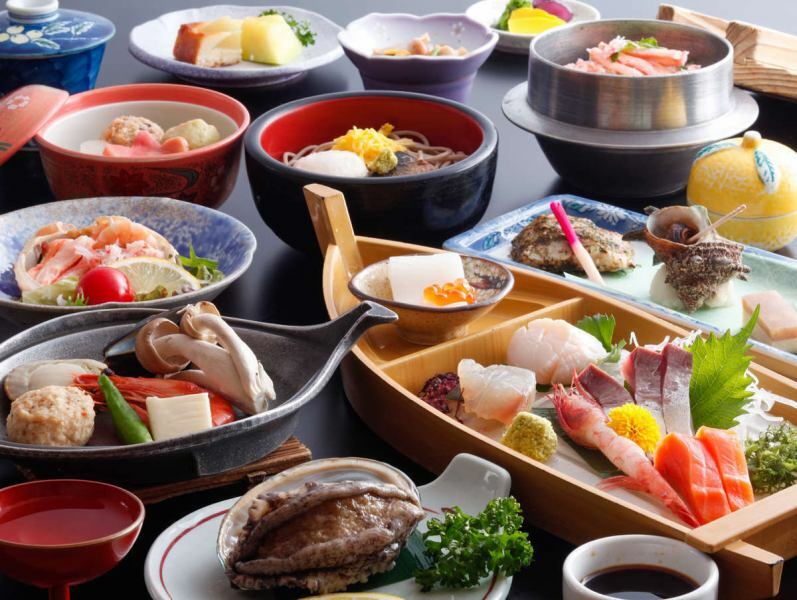 "Basic dinner", the chief chef's special Kaiseki Meal"Shio", the seafood in Hokuriku! 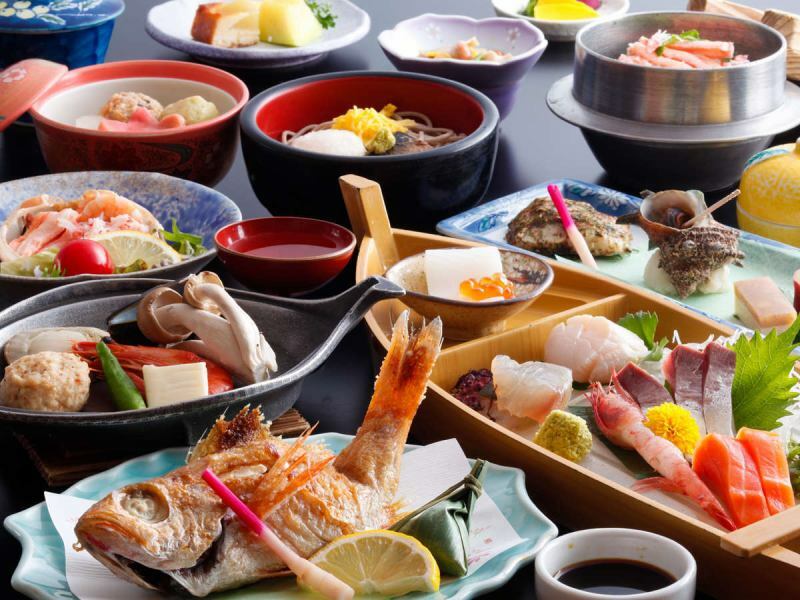 A Kaiseki Meal meal with a taste of winter such as yellowtail, sweet shrimp and Snow Crab. 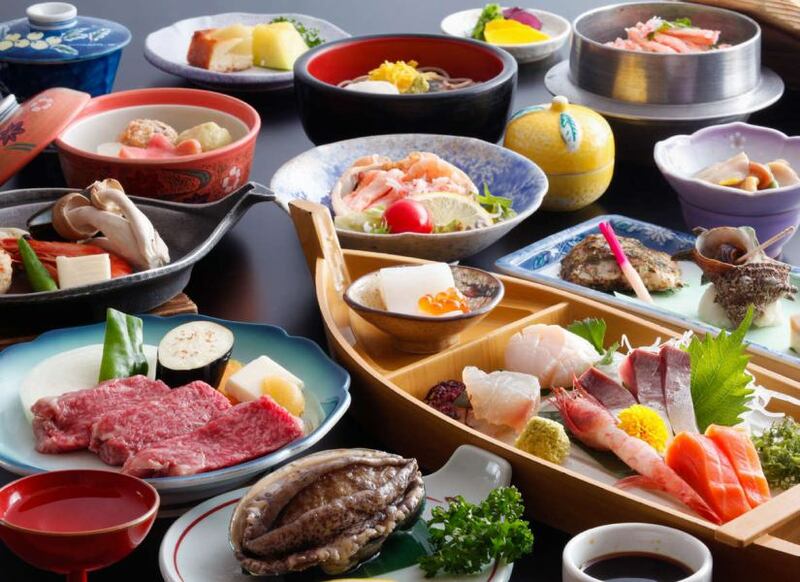 Please eat deliciously the taste of winter in Hokuriku, such as sweet shrimp and sashimi, fish cake a whole cup of boiled crab, and tongue shabu. 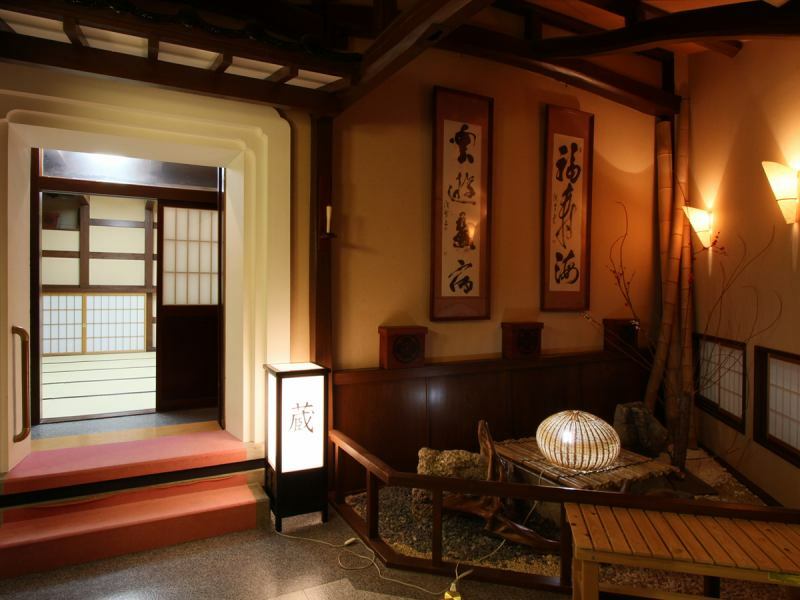 "Three types of taste in winter", "Enjoying Winter Delicacies Kaiseki Meal", First time·Crab·Sweet shrimps! Enjoy the taste of the winter in Hokuriku! "Haruka (far) Kaiseki Meal", on the iron plate jujujuu! 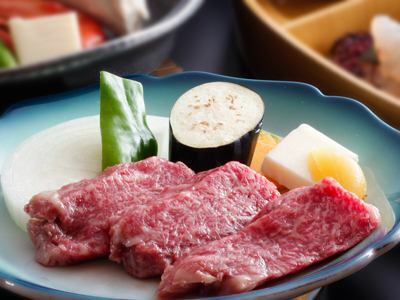 Please eat fun tasty Kuroge Wagyu beef steaks until the sound! 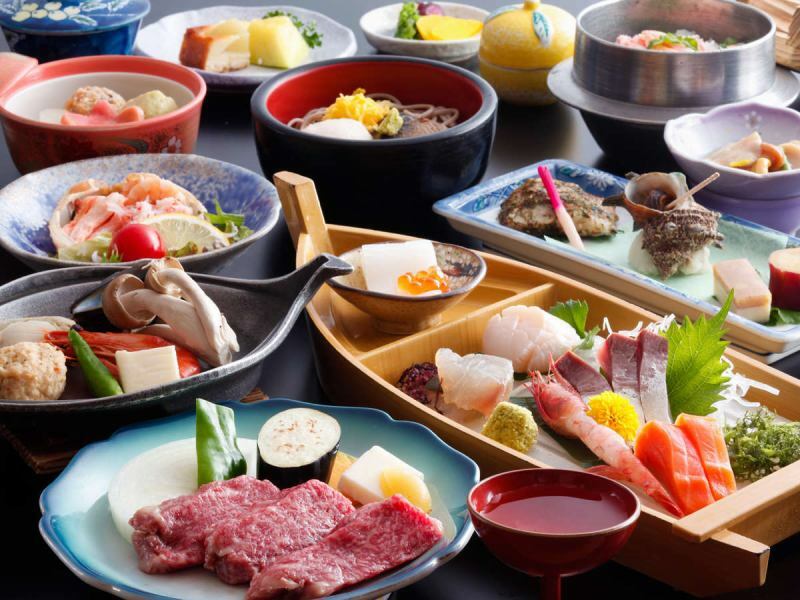 Kaiseki Meal cuisine with a Japanese beef steak of A4 rank in dishes with a focus on seafood of the season. Togetsuan's delicious beef steak with plenty of meat juice is also appreciated by local novice customers. Please eat deliciously Japanese beef steak with Passion chief Passion Togetsuan, who has been Togetsuan in not only fish but also meat. 【Wagyu Beef steak】Haruka(HALCA)Kaiseki Meal", Soft Kaiseki Meal Wagyu beef steak with plenty of meat juice! The trail is called "white toro" and its taste is excellent. Togetsuan, you can prepare a Kaiseki Meal dinner with two extravagant roosters. You can choose from "Shabu-shabu" at the first tail, "Salt-grilled" or "Boiled" at the second tail. Please eat popular luxury fish happily. 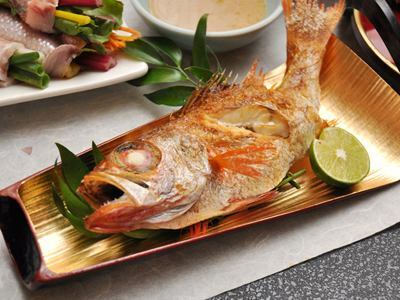 "Fully Enjoy Rosy Seabass Kaiseki Meal", 2 luxury tail fish luxury★, Recipes you can choose! A Kaiseki Meal with one noroguro 1 tail in the main. "Nodokuro" is called "white toro", high quality lipids and popular high quality fish characterized by melting character. 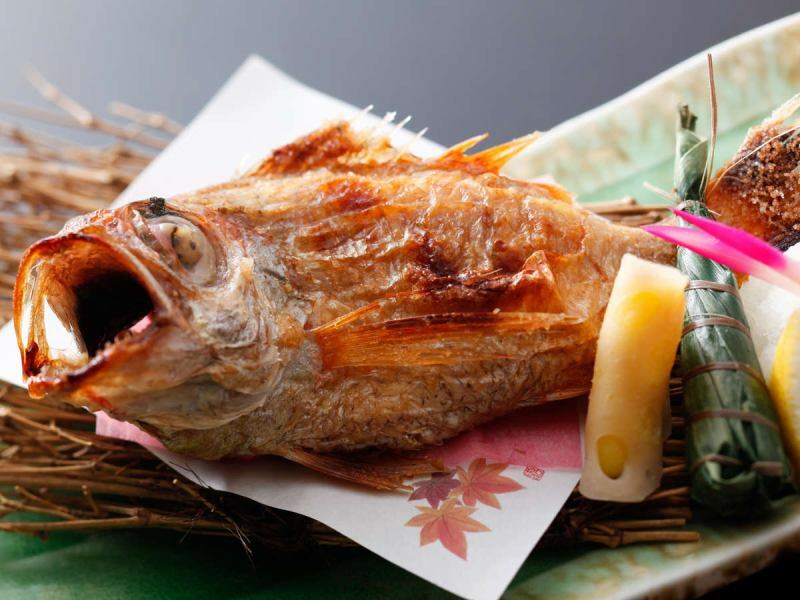 In Nodoguro with a Kaiseki Meal, it will put chubby one fish the throat glow to your dinner. You can choose the cooking method of the grill from salt-baked · boiled · shabu-shabu. "Trogue with a banquet Kaiseki Meal", a whole bunch of popular luxury fish of the tuna★, Recipes you can choose! "Moon Kaiseki Meal" with fresh live abalone on the cuisine of Notoyama seafood. You can choose your favorite cooking method from boiled steamed abalone, dancing and sashimi cooking methods. "Abalone with", "Moon Kaiseki Meal", one more item for basic dinner! Fresh abalone in your favorite recipe! 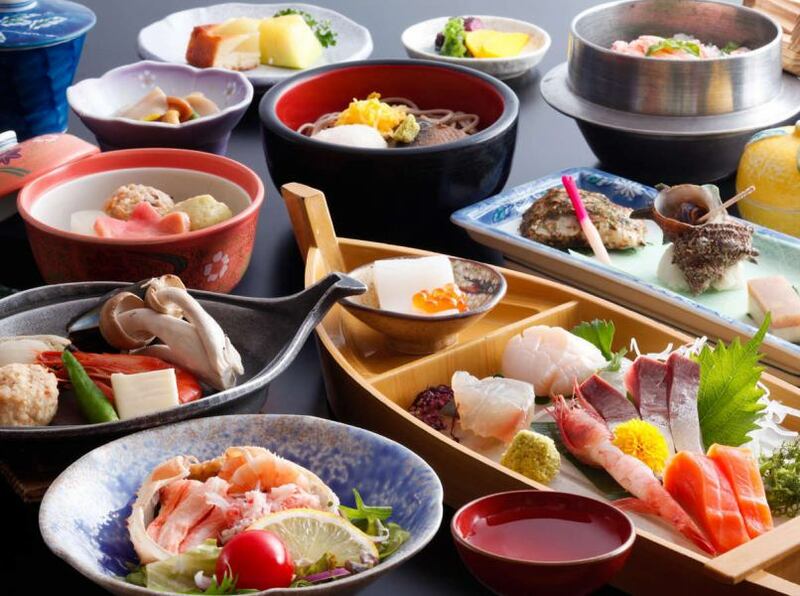 It is a luxurious Kaiseki Meal cuisine where you can fully enjoy the ingredients of Noto, such as fresh-bodied abalone that has survived until just before offering to customers, A4 rank soft Japanese beef steak, and seafood caught in the Japan Sea. A Kaiseki Meal dinner featuring plenty of Snow Crab from the king of winter taste. One cup of crab is a whole cup of boiled crab. The second cup is a crab sting and a Hosen Grilled. Hosen Grilled is an original dish of Togetsuan Board who baked the shell of a living crab with sake-made steamed rice. It is a Kaiseki Meal meal only for the period of crab ban. 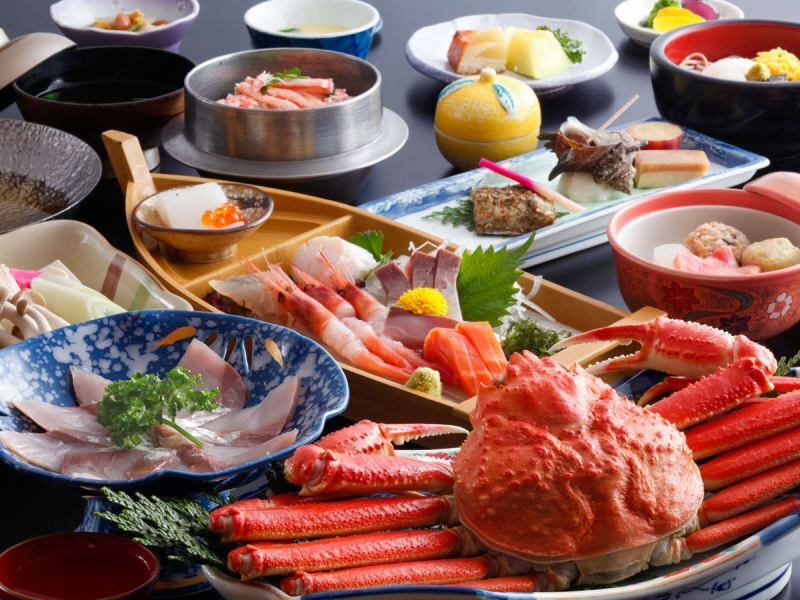 【Snow Crab exhaustive Kaiseki Meal】"Akane Kaiseki Meal"plan where you can taste 2 cups of Snow Crab with 3 recipes for "茜 会 茜"
"Gas shrimp", which has fast legs and can be tasted only in Hokuriku, and a classic "sweet shrimp", are prepared at Yuri. The white shrimp called "jewels" and white body is beautiful, prepared with osaki and kakiage. Please eat the spring ingredients happily. 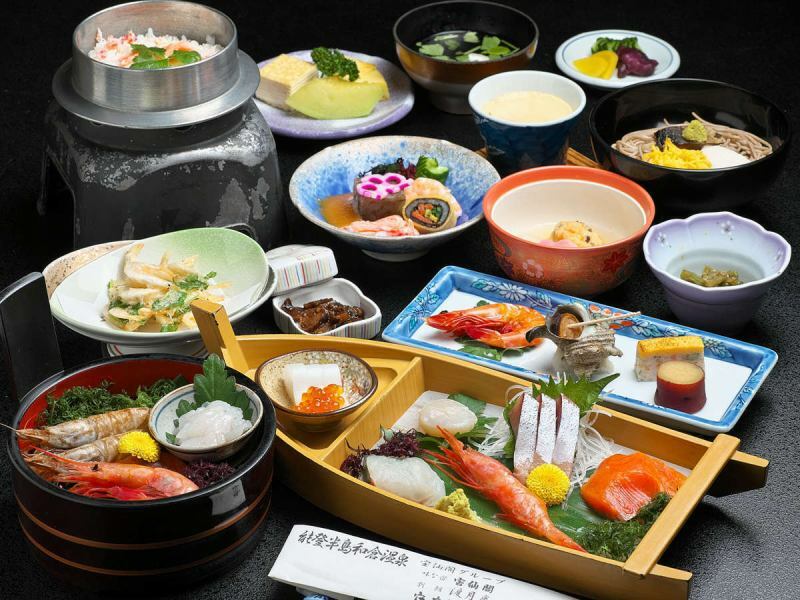 【Three kinds of shrimps】"Spring Kaiseki Meal", plan to eat and compare three types of shrimp that can only be tasted in Noto! It is used as a hall from the time of construction 100 years ago, from the window side you can see the Togetsu Bridge lighted by gas light, it is a dining venue full of spirit. 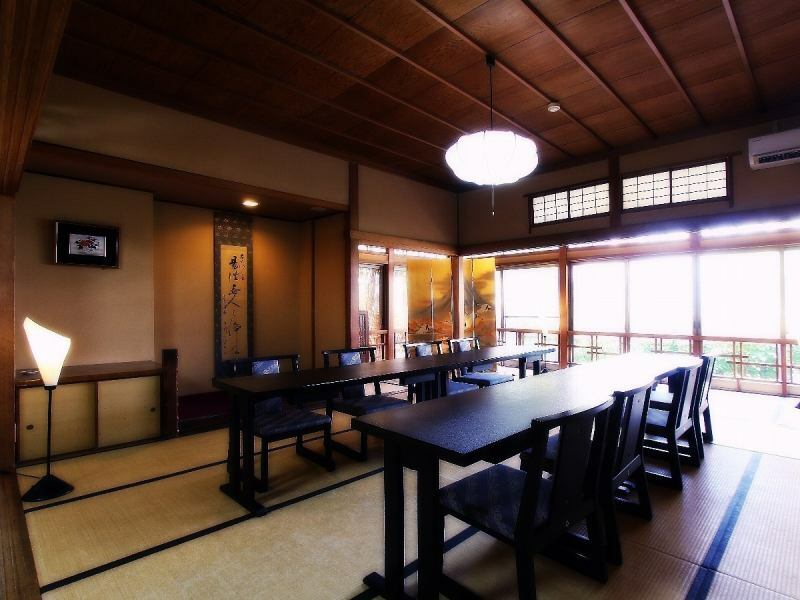 The dining venue "Kura" where the old warehouse was refurbished is a modernized Japanese-style room, a calm and warm space that makes us forget the daily bustle. The fishing ground is said to be a "natural crib" from its unique shape and abundant fish species due to plentiful plankton and good taste. Every morning, fresh seasonal fish from the Nanao Bay, which is said to be its natural cedar, is sent directly to the kitchen of this facility. 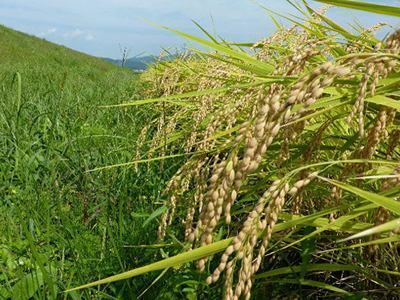 The rice of the hotel is a delicious rice that you raised carefully by contract farmers saying "red soil rice".Red soil rice means rice grown in red soil, unlike ordinary paddy rice. Since red soil rice is grown in a sticky soil unique to red soil, it is said that it is rich in nutrition and has a strong taste. Ishikawa Prefecture, which is said to be tasty of rice. You can enjoy breakfast with rice with dinner at the hotel. Ishikawa Prefecture's local brand crab's "Kano Crab". A crab with a blue tag that is landing at the fishing port of Noto from Kaga. 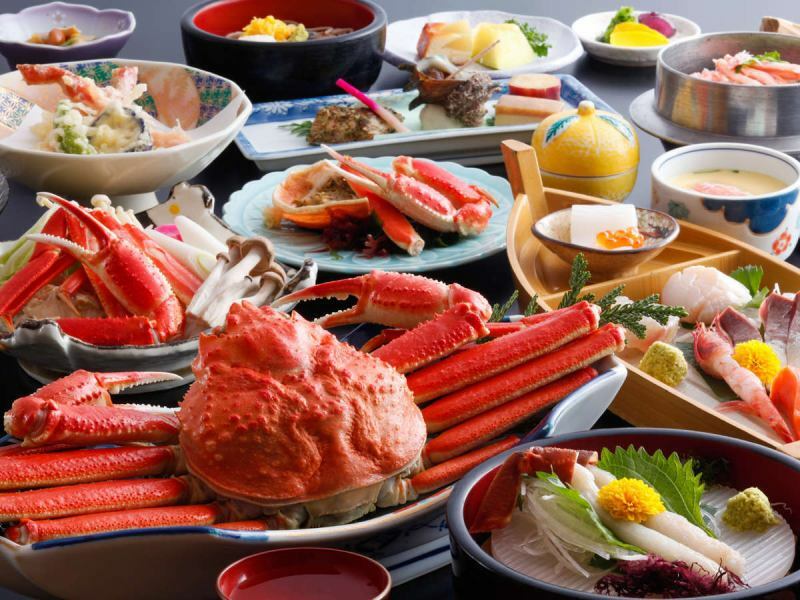 In travelers visiting Ishikawa Prefecture during the winter season, there are not a few who are looking forward to the winter taste Snow Crab. Togetsuan you can enjoy a cup of boiled crabs and a variety of cooking methods to "Kano Crab". 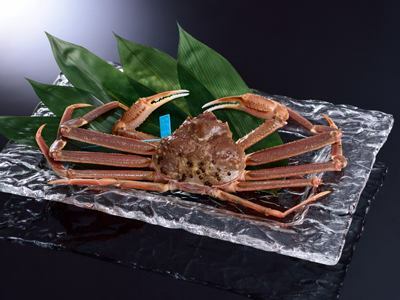 Let's taste "Kano Crab 1 cup with the Kaiseki Meal", Ishikawa prefecture tagged brand crab with your favorite recipe! "Kano Crab", "Australia(Like this)Kaiseki Meal! Two bowls of luxury brand giant crab "Kano Crab" luxuriously! "Kamakudzu" which is called a white toro. Food ingredients that you can enjoy a rich flavor but a rich taste of fat. "Throat" is called because throat is black. You can enjoy your favorite cooking method from the classic "Salt-grilled", "boiled" boiled with Noto's local soy sauce, and "Shabu Shabu". Togetsuan, we stick to not only seafood but also meat. Wagyu beef of rank A4 is softer to chew. Not only seafood, but also long handling of meat, cut carefully to bring out the taste of the meat.